One of the most problematic assumptions in the Significant Natural Resource Area Managment Plan (SNRAMP – Sin-ramp) is that the eucalyptus forests are a fire hazard, and that thinning/ felling them, removing the existing understory, and substituting native plants will reduce the danger. 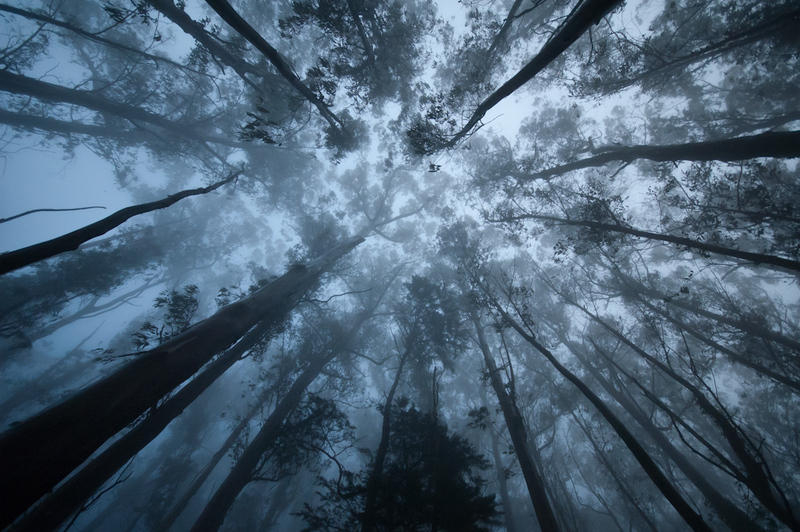 First, in San Francisco’s foggy climate, the eucalyptus trees actually harvest moisture, and the dense naturalized understory traps this moisture. These are some of the wettest areas in the city through the peak fire season. Second, eucalyptus is actually less flammable than most native plants. Finally, the tall trees act as an effective wind-break, thus reducing the risk of wind-driven fires. These assumptions are false and we will provide scientific and experiential evidence that they are false. Unless the final EIR can provide scientific evidence and/or actual experience to support these assumptions in the DEIR, these statements regarding fire hazards must be revised to be consistent with available evidence. Fear of fire has fueled the heated debate about native plant restorations in the Bay Area. Native plant advocates want the public to believe that the non-native forest is highly flammable, that its destruction and replacement with native landscapes would make us safer. Nothing could be further from the truth. The fact is that the forest—whether it is native or non-native—is generally less flammable than the landscape that is native to California. In the specific case of the Sutro Forest in San Francisco, this general principal is particularly true: the existing forest is significantly less flammable than the landscape that is native to that location. The fire on Angel Island in October 2008, demonstrates that native grassland is more flammable than the non-native forest. According to an “environmental scientist” from the California state park system, 80 acres of eucalyptus were removed from Angel Island 12 years ago in order to restore native grassland. Only 6 acres of eucalyptus remain. [Ref:“Rains expected to help heal Angel Island,” SF Chronicle, October 14, 2008] The fire that burned 400 acres of the 740 acres of Angel Island in 2008 stopped at the forest edge: “At the edge of the burn belt lie strips of intact tree groves…a torched swath intercut with untouched forest.” [Ref: “After fire, Angel Island is a park of contrasts,” SF Chronicle, October 15, 2008] It was the native grassland and brush that burned on Angel Island and the park rangers were ecstatic about the beneficial effects of the fire: “The shrubs—coyote bush, monkey flower and California sage—should green up with the first storms…The grasses will grow up quickly and will look like a golf course.” Ironically, the “environmental scientist” continues to claim that the eucalyptus forest was highly flammable, though it played no part in this fire and there was no history of there ever having been a fire in the eucalyptus during the 100 years prior to their removal. Unfortunately, the 1991 fire in the Oakland hills has enabled native plant advocates to maintain the fiction that eucalyptus is highly flammable. And in that case there is no doubt that they were involved in that devastating fire. However, there were factors in that fire that are not applicable to San Francisco. The climate in San Francisco is milder than the climate in the East Bay because of the moderating influence of the ocean. It is cooler in the summer and warmer in the winter. There are never prolonged, hard freezes in San Francisco that cause the eucalyptus to die back, creating dead, flammable leaf litter. The 1991 fire in the Oakland hills occurred in the fall, following a hard winter freeze that produced large amounts of flammable leaf litter. In fact, there were several wildfires in the Oakland hills in the 20th century. Each followed a hard winter causing vegetation to die back. According to the FEMA Technical Report, the 1991 Oakland hills fire started in grass, spread to dry brush, and was then driven by the wind to burn everything in its path. The fire burned native plants and trees as readily as eucalyptus. When it is hot and dry in the Oakland hills, as it was at the time of the 1991 fire, it is cool and damp in San Francisco. Fogs from the ocean drift over the eucalyptus forests, condensing on the leaves of the trees, falling to the ground, moistening the leaf litter. [Ref: Gilliam, Harold, The Weather of the San Francisco Bay Area, UC Press, 2002] When the heat from the land meets the cool ocean air, the result is the fog that blankets San Francisco during the summer. These are not the conditions for fire ignition that exist in the Oakland hills. UCSF applied for a FEMA grant to fund its project to destroy the eucalyptus forest and restore native chaparral, based on its claim that the eucalyptus forest is highly flammable. In its letter of October 1, 2009 (obtained by FOIA request), FEMA raised questions about UCSF’s claim of fire hazard. (See Attachment VII-A.) FEMA asked UCSF to explain how fire hazard would be reduced by eliminating most of the existing forest, given that reducing moisture on the forest floor by eliminating the tall trees that condense the fog from the air could increase the potential for ignition. FEMA also asked UCSF to provide “scientific evidence” to support its response to this question. Rather than answer this and other questions, UCSF chose to withdraw its FEMA application. The predominant species of eucalyptus in California, the blue gum eucalyptus (E. globulus) is native to Tasmania. Scientists at the University of Tasmania conducted laboratory experiments on the plants and trees in the Tasmanian forest to determine the relative flammability of their native species. The blue gum eucalyptus (E. globulus) is included in this study. The study reports that, “E. globulus leaves, both juvenile and adult, presented the greatest resistance [to ignition] of all the eucalypts studied. In this case, leaf thickness was important as well as the presence of a waxy cuticle.” Also, in a table entitled “Rate of flame front movement,” the comment for E. globulus leaves is “resistant to combustion.” [Ref: Dickinson, K.J.M. and Kirkpatrick, J.B., “The flammability and energy content of some important plant species and fuel components in the forests of southeastern Tasmania,” Journal of Biogeography, 1985, 12: 121-134.] In other words, despite the oil content in the leaf, its physical properties protect the leaf from ignition. Even if oils were a factor in flammability, there are many native plants that are equally oily, such as the ubiquitous coyote brush and bays. According to Cornell University studies, essential/volatile oils in blue gum eucalyptus leaves range from less than 1.5 to over 3.5%. The leaves of native California bay laurel trees contain 7.5% of essential/volatile oils, more than twice the amount of oil in leaves of blue gums. Likewise, non-native broom is not more flammable than its native counterpart in the chaparral plant community, coyote brush. The leaves of both shrubs are small, the fine fuel that ignites more readily than larger leaves and branches. But the leaves of native coyote brush contain oil not found in non-native broom. And the branches of broom are green to the ground, unlike the branches of coyote brush which become woody thickets with age. Broom therefore contains more moisture than coyote brush, which reduces its combustibility. Fire is an essential feature of the landscape that is native to California. [Ref: Sugihara, Neil, Fire in California’s Ecosystems, UC Press, 2006] Destroying a non-native forest in order to create a native landscape of grassland and scrub will not reduce fire hazard. Most fires in California are hot, wind-driven fires in which everything burns. The composition of the fuel load in a wind-driven fire is irrelevant. Everything in its path will burn. [Ref: Keeley, J, and Fotheringham, “Impact of past, present, and future fire regimes on North American Mediterranean shrublands, pages 218-262 in Veblen, et al., editors, Fire and climate change in temperate ecosystems of the Western Americas, 2003.] 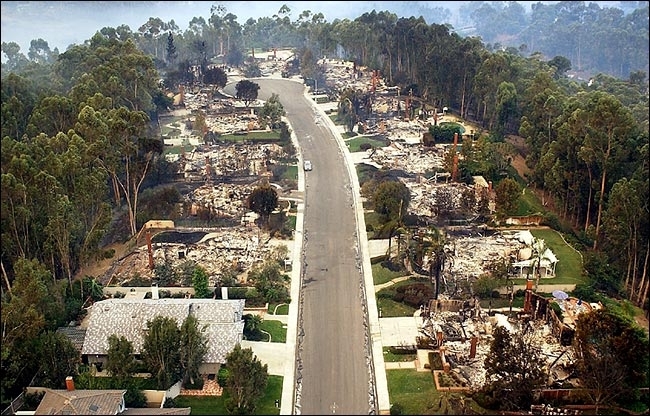 The 1991 fire in the Oakland hills was an example of such a fire. According to the FEMA technical report on that fire, both native and non-native vegetation, as well as about 3,800 homes burned in that fire. Windbreaks are therefore one of the few defenses in a wind-driven fire. For that reason, in its letter of October 1, 2009 (see attachment VII-A), FEMA asked UCSF to explain how the destruction of the tall trees on Mount Sutro would reduce fire hazard. FEMA noted that eliminating the windbreak that the tall trees provide has the potential to enable a wind-driven fire to sweep through the forest unobstructed. FEMA also asked UCSF to provide “scientific evidence” to support its answer to this question. We repeat, UCSF chose to withdraw its application for FEMA funding of its project rather than answer this question. The more shade on the forest floor. Thinning the forest will not reduce fire hazard. In fact, it will increase fire hazard. Thinning the forest will not reduce fire hazards. In the late 1990s, as a member of UCSF, I attended a couple of sessions set up by a Berkeley group that proposed a multi-million dollar project to UCSF. This group proposed a step-by-step wiping out of the eucalypts of Mt. Sutro, poisoning the root systems, and after a period of 5-10 years, setting up a sort of garden on the site. I was astounded by the lack of real knowledge of Mt. Sutro by this obviously profit-motivated bunch of destroyers. There were also in attendance a couple of San Franciscans well-known for their “back to original SF nature” views. After several years, I thought that the whole project proposed by this bunch had been abandoned, but it appears that their ideas may have stuck with someone in the UCSF hierarchy. Who are those in UCSF that have accepted the idea? Why else is “UCSF” even listening to this proposal? Webmaster: Thanks for telling us about your experience and for your good questions. Yes, UC Berkeley has been clear-cutting the non-native trees on its properties for over 10 years, using the “fire hazard” cover story. You can read about those projects here: http://milliontrees.me. And UCSF has been engaged in the same effort for over 10 years, although they are not as far along in the actual cutting of the trees because they haven’t found their “deep pocket.” You can read about UCSF’s projects here: http://savesutro.com. As for why UCSF got involved in this effort to destroy non-native trees, we can’t say. It doesn’t make sense to us either.